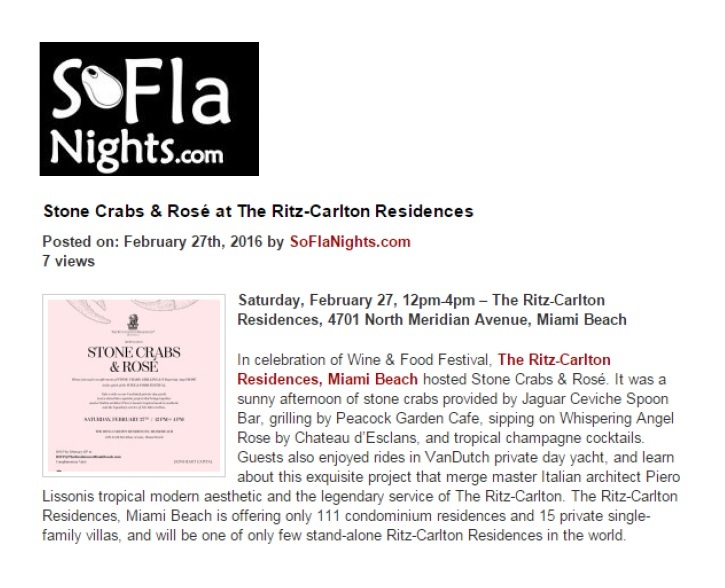 In celebration of Wine & Food Festival, The Ritz-Carlton Residences, Miami Beach hosted Stone Crabs & Rosé. It was a sunny afternoon of stone crabs provided by Jaguar Ceviche Spoon Bar, grilling by Peacock Garden Cafe, sipping on Whispering Angel Rose by Chateau d’Esclans, and tropical champagne cocktails. Guests also enjoyed rides in VanDutch private day yacht, and learn about this exquisite project that merge master Italian architect Piero Lissonis tropical modern aesthetic and the legendary service of The Ritz-Carlton. The Ritz-Carlton Residences, Miami Beach is offering only 111 condominium residences and 15 private single-family villas, and will be one of only few stand-alone Ritz-Carlton Residences in the world.